Hanwha Techwin, one of South Korea’s defence companies, is marketing its K9 Thunder 155mm/52 calibre self-propelled howitzer in at Eurosatory 2016, a high profile defence exhibition taking place in Paris this week (13-17 June). 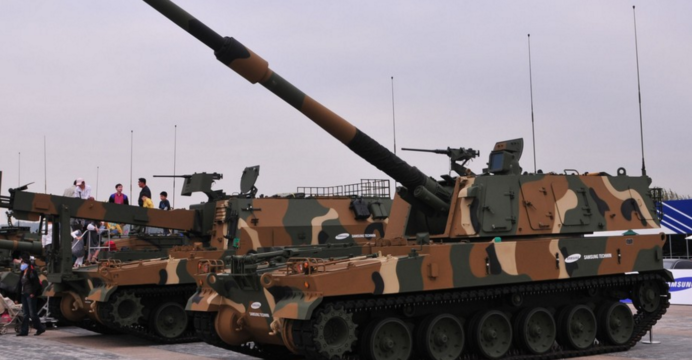 According to IHS Jane’s, Hanwha Techwin is competing for at least one prospective European requirement for self-propelled artillery howitzers. At present, it is in the midst of completing a deal with Poland, which is poised to acquire the K9 under its Krab program. The K9 was also chosen by the Turkish Army, which is inducting a locally produced variant of the K9 – the Firtina. When firing the M549A1 high-explosive rocket-assisted round, the K9’s 52 calibre gun is capable of firing at ranges of up to 30km. An extended range projectile can enable the K9 to fire at up to nearly 42km. Development of the K9 began in 1989, the first howitzer prototype entered the testing phase in 1996. In 1999, the Republic of Korea (RoK) Army began inducting the K9, becoming the first army in Asia to field a 52 calibre artillery piece. The K9 is supported by the K10 automatic ammunition re-supply vehicle (ARV), which is built on the same core vehicle platform as the K9. The K10 is capable of automatically transferring 12 rounds per minute to the K9 using a conveyor belt. A single K10 is supporting two K9 howitzers. The K9 Thunder has been a relatively successful export product for South Korea. Turkey was the first major procurer; the K9 is locally produced under license in Turkey as the T-155 Firtina and 300 units are believed to have been produced for the Turkish Army. The flexible transfer-of-technology terms and (presumably) competitive price point has positioned the K9 as an attractive option for prospective NATO and non-NATO users alike.